John met at my house and we just chunked our gear into the back of the truck. All the dry goods went into the “kitchen box” and what few cold things we had between us went into the drink cooler. By the time we got on the road we found Scott was already at PINS, and that Eduardo was already rolling. On the road we were in touch with everybody but Mary-Kay and Skip, who got a late start. By the time that we got to Malachite, about 1130, everybody showed up quickly. 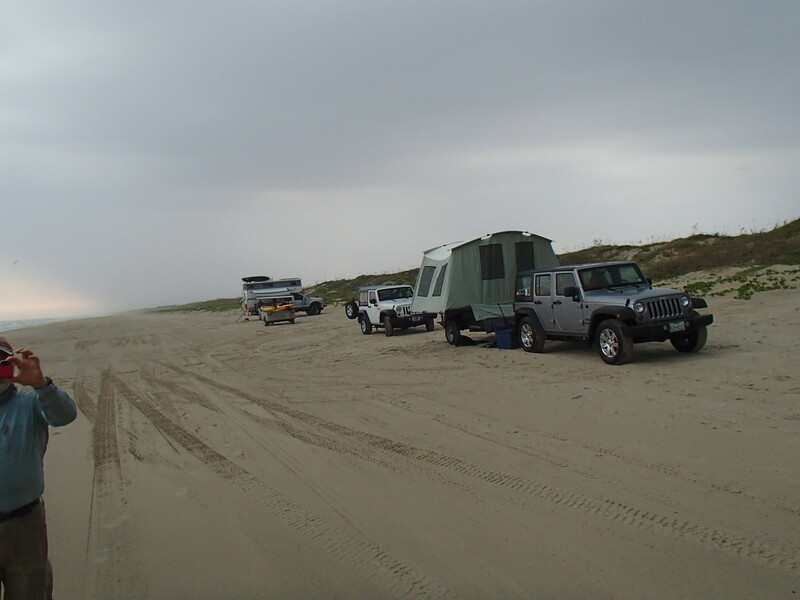 A quick rigging of rods and back-up gear, along with moving a cooler to the front of the truck, and the Tundra was ready. Time to roll out, finally, around 1300. Our game plan was to look for fish and find a place to camp around mile 30. The weather was a bit breezy for fly fishing all afternoon, but finding feeding fish turned out to be more of a challenge. After miles of cruising the beach, we stopped and wet a line when we saw birds feeding way out in the horizon. Only smallish ladyfish were brought to hand. The travelling on Friday was extremely easy. The sand was packed in most places and there was very little debris. 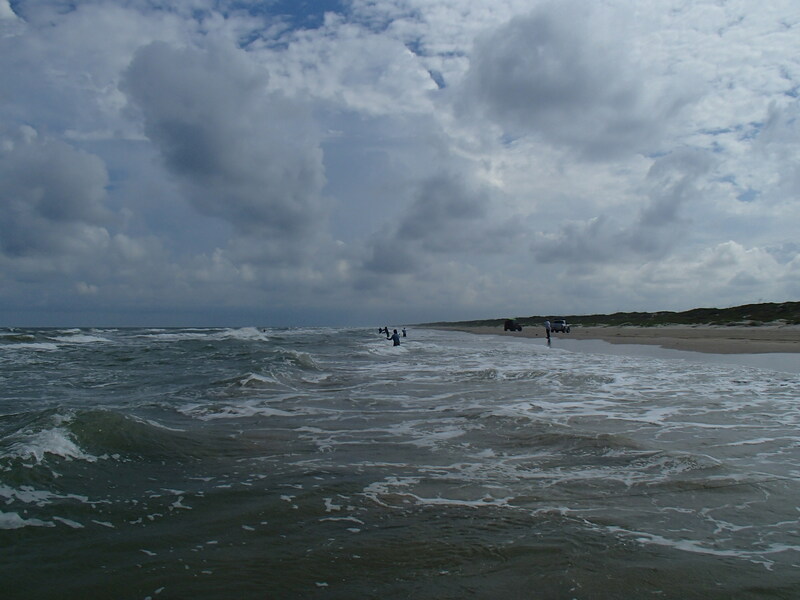 We were able to watch the water, with no real activity in it, without having to be too concerned about loose sand. The clouds got darker, and flashes of lightning were off in the distance as we talked about making dinner. The campfire that John had worked so hard on was drowned as the rain came down and the wind shifted 180°. Every tent and tent-cot that was up was turned over, or flattened. I re-anchored mine by tying it to the truck. John weighed his down by getting in it. Eduardo joined Ron and Garland in the Jumping Jack. 3 of us decided that a room in town would be a better option. Since we hadn’t heard from Skip and Mary-Kay, we didn’t know that they had also chosen that option. Morning came, but the rain never let up until well after sunrise. Coffee was late as our smaller group recounted the night, and had breakfast. Since we had a lot of wet gear, we decided to stay in place and let the sun dry what it could. This is where 4 of our group, which had stayed in town, found us, standing in the water, fishing. All morning we had occasional showers, and just enough fish, mostly whiting, to keep us interested in fishing. All afternoon Saturday the weather was perfect, just with a stronger wind than we liked for fly fishing. Our camp finally broke apart after lunch as most of the gear was dry. Moving north, away from the jetties turned out to be a good idea. 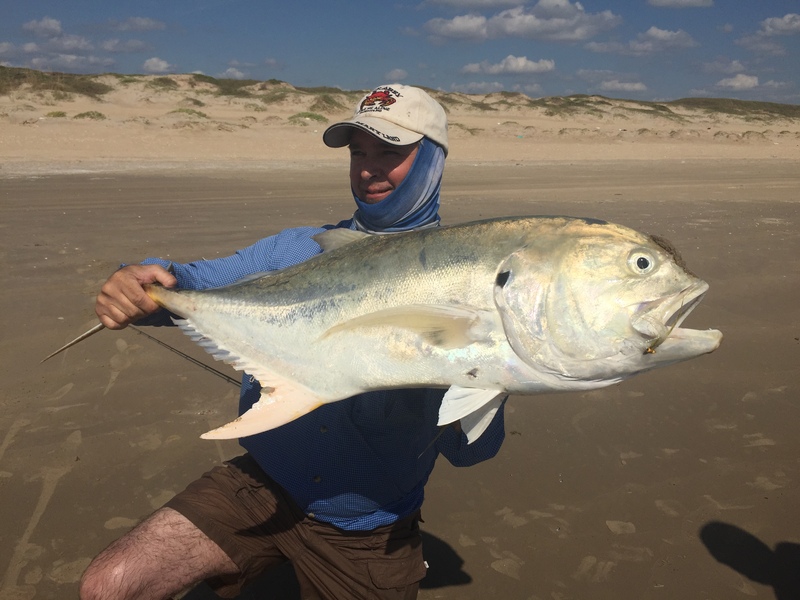 An angler coming from the jetties area told us that fishing was slow, travel was tough, and the water was off-color. His group had gotten into some big sharks, but not at the pace he was hoping for. Tents up, dinner stuff packed away, the entire group scattered for their shelters. For some reason we were tired. Sunday morning, at 0430, I put kettle on for hot water and prepared the coffee pot. Garland joined me soon and we brought our chairs over to watch the stars and chat. Soon there was a line of chairs at the coffee pot and most of the group were admiring the stars and enjoying the morning. The only time we used our headlamps or flashlights was when we absolutely had to. 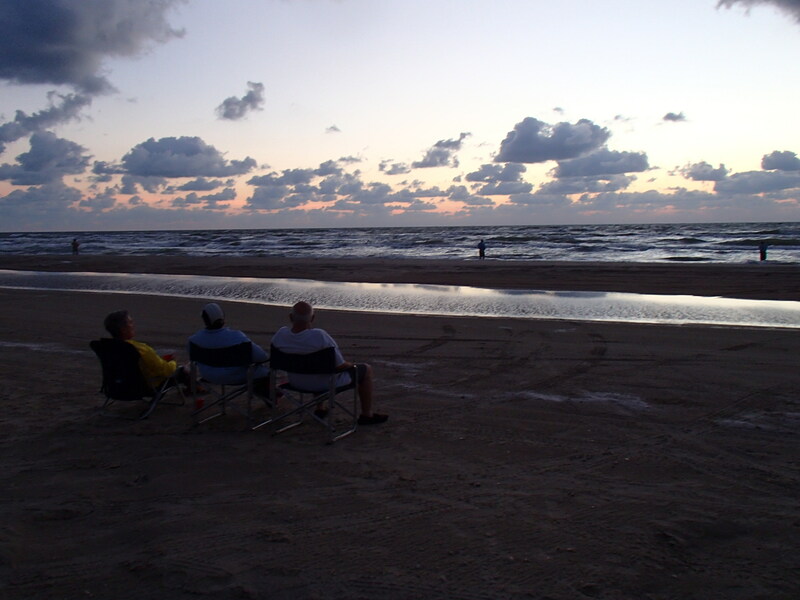 But as pleasant as the morning was, and as comfortable as our chairs were, we came to fish. 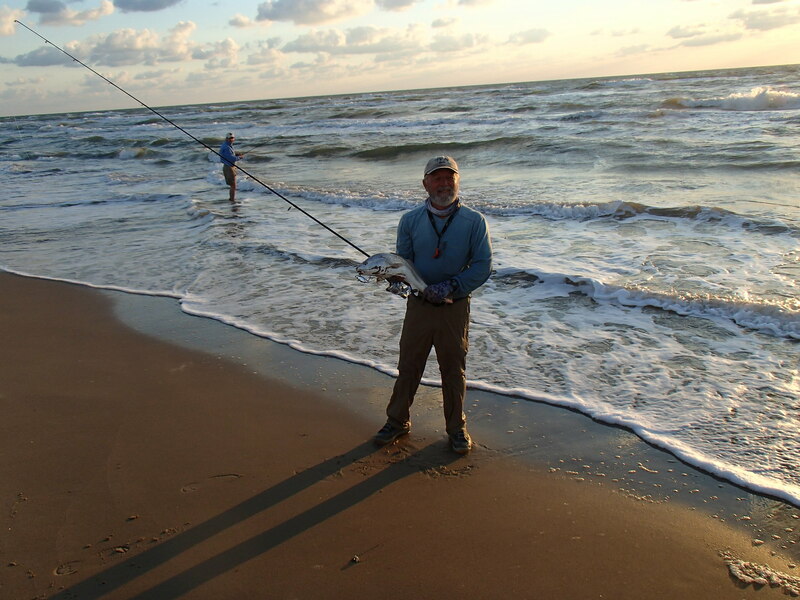 As the sky lightened some of us started grabbing rods and making our way to the water. Others sat, enjoying their coffee, and watching our friends fish. John landed a nice red just at sunrise Sunday morning. What we didn’t know is that Jerry was flinging a spoon into the third gut, hooking up with Spanish mackerels, and releasing them. About 0930 or so, we packed up camp and started making our way north towards the Malachite parking lot. Movement in the water caught our attention. It was only a flash, or a splash, but we had to throw something in the water. Ladyfish and baby jacks were there and were willing to bite. This is the location that Jerry hooked into a 22 pound jack. At the malachite parking lot we reloaded most of our gear and disassembled the rods before the trip home. A quick shower and we were on the road. A small group stopped for food one the way home. The rest of us just drove to Houston, stopping only for jerky. 1630, home, transload, shake hands, and promise “next time” we part ways. 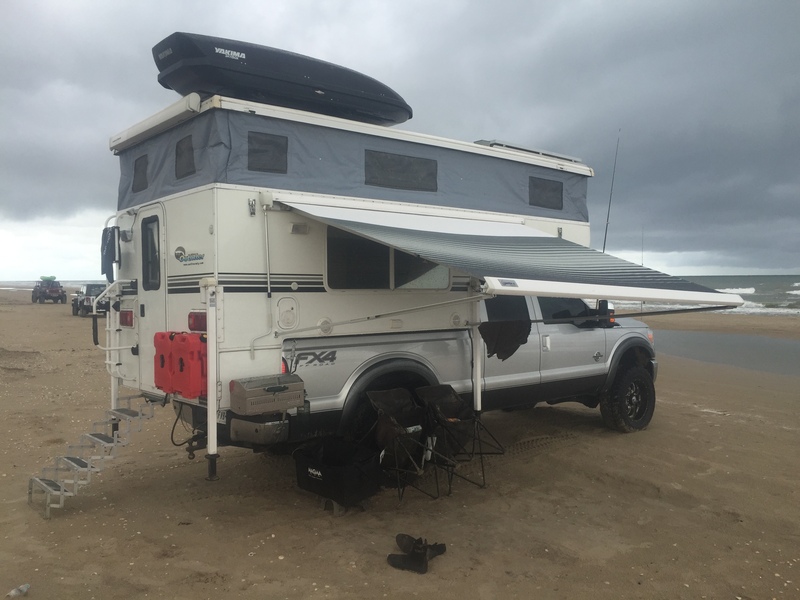 Now the only task was to get all the sand and salt out of all of our gear. It seems we missed the red tide by leaving 8 hours before it rolled in.